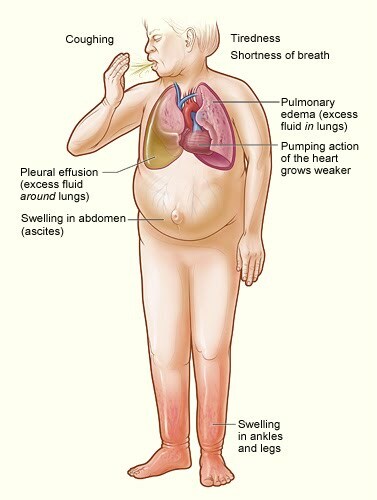 Heart failure means that your heart can not pump enough blood to meet the body's demands. About 5 million Americans (1 in 60) have the condition. Anybody can get it - even those who run marathons. However, heart failure is more common in people who are older or who have other medical conditions that affect the cardiovascular system. These include coronary artery problems and high blood pressure. The treatments depend on the type of heart failure you have. Some of the potential options include lifestyle changes, medications (for example, beta-blockers), and (sometimes) surgery. Currently, it's difficult to cure heart failure, but treatments can help to improve symptoms. Some patients who have very serious heart failure may be eligible to receive a transplant. Surgeons will replace the damaged heart with a healthy one that was gifted by an organ donor after they had been declared brain dead. Although transplants help patients, only about 2200 surgeries are performed each year. Many thousands of people who would benefit from a new heart won't receive one because of the shortage of organ donors. What does the Campbell lab do? We do experiments that help us to understand what has gone wrong in a failing heart and to test ideas that might help scientists and clinicians to develop better treatments. Where can I learn more about heart failure? There are lots of good sources of information on the web. Here are a few. "A Stronger Pump" - a patient-orientated guide from Emory University.